Consarnit and tarnation! 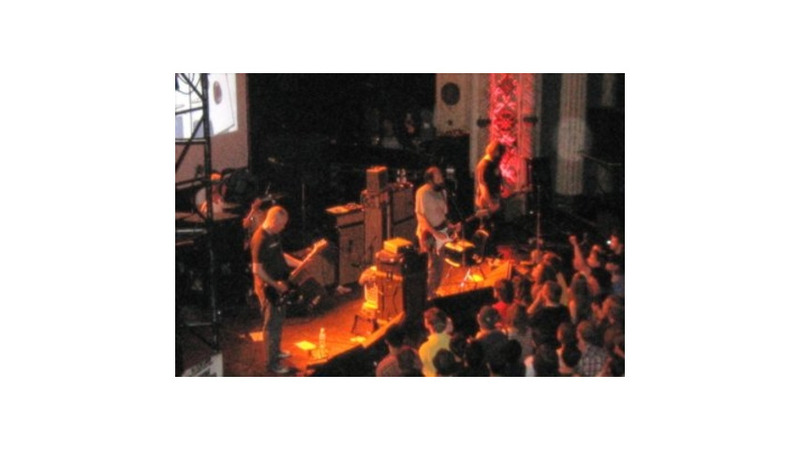 What is it with that Built To Spill as a live act? One minute they’re defying expectations and the next they’re doing just what you hoped they wouldn’t. It makes for a concert experience that’s by turns exhilarating and frustrating, which isn’t necessarily a good thing, but not exactly a bad one either. Take the other night in Chicago for instance. Defying basic rock star mores, the band wandered on stage 15 minutes before show time with lights up full and began to set up and tune their gear. Huh? Then leader Doug Marsch (sporting an ever-burgeoning beard) set up a projector and began an ersatz slideshow of artwork by Mike Scheer (whose work adorns the band's latest CD cover), creating an atmosphere of a highly amplified high school assembly. Then, like it was conducting a sound check, the band wandered into its performance, opening with “Traces” from the new disc. It was an odd choice to get the audience going, with its languid rhythm and spacey melody. Not exactly food for fist-pumping and head-bobbing, but one might suspect that was the intention. Things picked up considerably with a powerful take on “Sidewalk,” with the five-piece snapping into step on the song’s dangerous corners. The band continued on in a positive direction with the searing “Going Against Your Mind,” which built with controlled frenzy. Aside from a brief passage with Marsh fiddling with a guitar effects box, the tune didn’t stray far into jam territory.